Location: Texas River School’s River Camp is an acre of leased-access perfect for fishing and boating, that also includes a camping area. The River Camp is located in eastern Travis County on the northern bank of the Colorado River, approximately four miles downriver of the Montopolis Street Bridge crossing, and is accessible from Farm to Market Highway 969 as well as the river. Area Description: The River Camp has approximately 225 feet of river access for bank fishing, serves as a boat launch, and offers a day-use facility with an overnight campground. Amenities include two environmental toilets, several picnic tables, a large campfire ring, and eight primitive campsites. 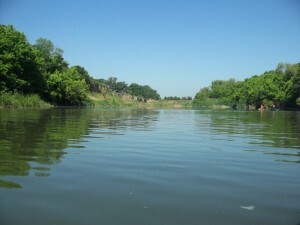 Set on the Colorado River in east Austin, the River Camp is located five miles downriver from the Longhorn Dam; 3.5 miles downriver from the Montopolis Bridge; five miles upriver from the Hwy 973 take out; 17.5 miles upriver from Little Webberville Park; and 22.5 miles from Big Webberville Park. It is 50 miles upriver from Bastrop and 284 miles from the Gulf of Mexico. Special Conditions on Public Use: Advance reservations must be secured through Texas River School. Call (512) 289-0750 to receive the gate code to gain access. Hiking and camping is restricted to designated areas. Fishing Regulations: All species are currently managed under statewide regulations. River Flow: Monitor the flow rate at Hydromet (click the 122 meter for specifics) or with the USGS. Boat Rentals: Texas River School has a fleet of 50 boats and ample lifejackets and paddles. Options include shuttle (with a fee), individual boat rental, and guided tours. Please call for more information regarding all of these options. Entrance Fees and Camping Rates: There is a $5 per person (12 and older) fee for entry to the River Camp, $2.50 for 12 and under. Day-use hours of access are from 8:00 am through sunset. Campsites are $15 per night plus the entrance fee per person. Individual campsites can have up to six people and two tents, and is reserved from 12 pm on the day of arrival through 12 pm on the day of departure. No fires are permitted other than in the campfire ring provided. Gas cook stoves are permitted. Private use of the whole campground is $300 per night (which includes entrance fees). Rates may vary depending on upcoming Austin and area events (including, but not limited to, F1, Austin City Limits Festival, and SXSW). Please call for special event rates. Pack It In, Pack It Out: Texas River School teaches students to leave the environment cleaner and more natural than when found and, as you can see from the history of the camp below, the River Camp is a perfect example of that. We encourage and expect all visitors to practice the No Trace concept by taking all trash out of the campground and disposing of it properly. Leave No Trace! Parking: Due to the Critical Water Quality Zone, vehicles must be parked on the outside of the gate that encloses the River Camp. We ask that you have a maximum of two vehicles per campsite only. Look for the sign designating the parking spaces. If you must unload your vehicle, please do so promptly without leaving the vehicle for more than 30 minutes. This is only to unload boats and camping equipment. Pets: All pets must be kept under control at all times. Please do not allow your pet to be harmful to plants or animals. Please clean up after your pet, and do not allow them to be a nuisance (i.e., excessive barking). The River Camp is located on the Colorado River about five miles downriver from the Longhorn Dam and Lady Bird Lake. The River Camp became a reality when Joe Kendall and Wayne Gronquist started acquiring lots in the 70 lot / 25 acre Imperial Valley subdivision that had originally been planned for residential development. After the development was deemed un-buildable, due to its location within the 100-year flood plain, lot owners began neglecting the land and it quickly fell into disarray. Prostitution, illegal dumping, and drug use became rampant. However, after Texas River School acquired several acres within the development, they formed a Land Owner’s Association, installed a gate, removed hundreds of thousands of pounds of trash, and the subdivision has become a much safer, more peaceful place to visit. The River Camp now boasts a solar power system, a water collection system, two Eloo waterless toilets, an organic garden, tent sites, a camp-fire area, and river access. With additional grants, Texas River School plans to improve and protect access to both the camp and the river. Visit, Rent a camp site, or plan a camping trip!